The children are settling in really well and have been busy exploring the classroom both inside and out. We have a new area for all our budding "Sing stars" in the conservatory, where the children can perform - singing and dancing, exploring the instruments and having fun together! We are very fortunate that over the summer Matt Dodman very kindly volunteered to build us an AMAZING mud kitchen, with soil donated by the Co-op on Highlands Road. Our picnic table along with other outdoor areas have been transformed by artificial grass given to us by "Jimmy's Helping Hands", a local landscaper. The children have been very busy today planting up herbs very kindly donated to us by Scott Yates, a gardening parent from Year 1. They will really add to the whole sensory experience as they add the herbs to their various concoctions and get them talking.The children love it all and spend a lot of time here, mixing, pouring, setting up tea parties, chatting, sharing and having a thoroughly FABULOUS time. Doesn't it look fantastic? A huge thank you to the overwhelming generosity of these kind people. We have introduced hammers into our Builders Yard. 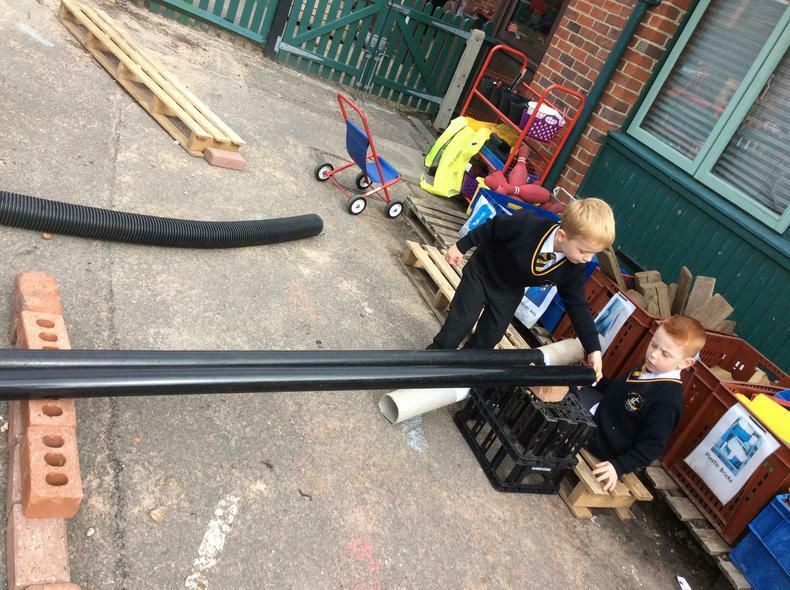 The school were very fortunate to have new Interactive Wipeboards installed throughout the school over the summer, but Reception have also benefited from all that packaging, and the narrow, long pallets are perfect for building and hammering! 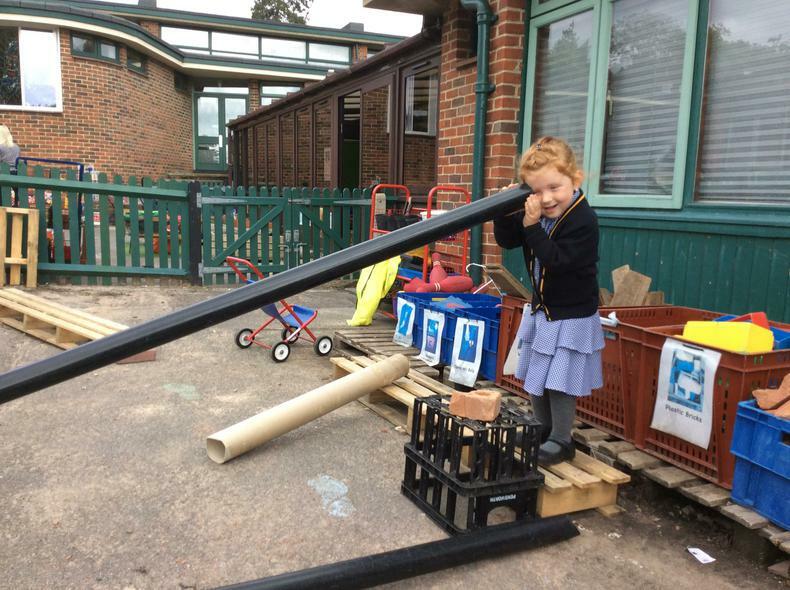 The children learn straightaway how to use them safely and they love the responsibility and understand the very important need to follow the rules so everyone keeps safe. 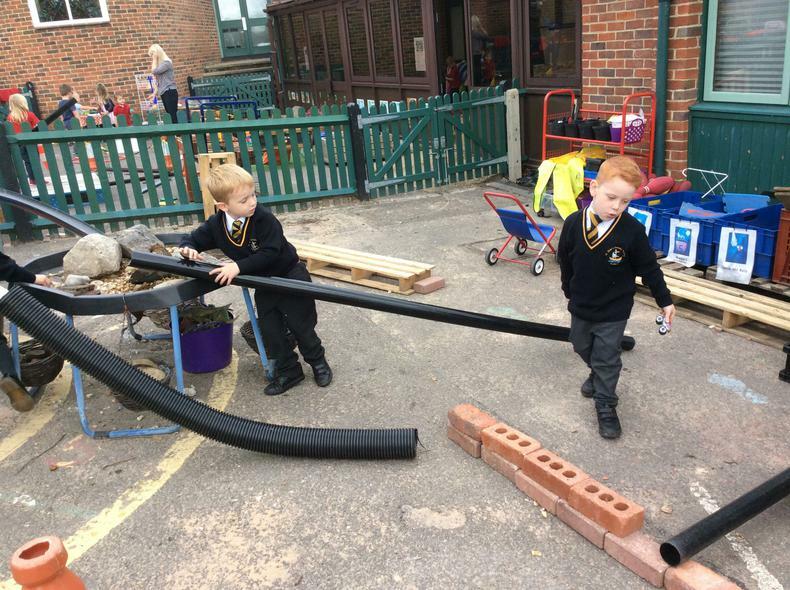 The cars are a huge hit, but using them outside with gutters adds to the excitement and by the end of their first full week the children were busy working together to extend their miniature roadways. 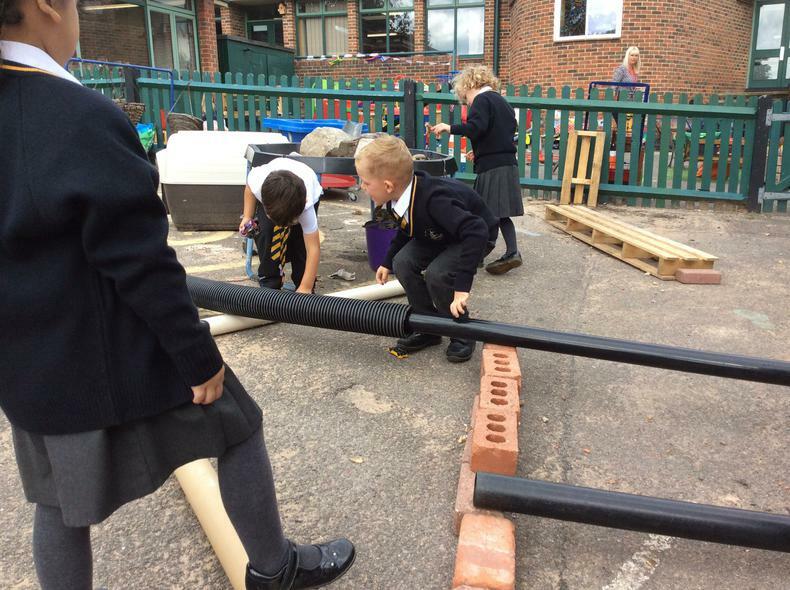 This took lots of negotiation and trial and error to find ways to solve the problem of making it longer by linking the gutters together - they were a great team tackling this challenge.